I’m not sure who was more excited about getting their books autographed the other night at the launch of Beyond the Stars; the punters or the authors and illustrators! 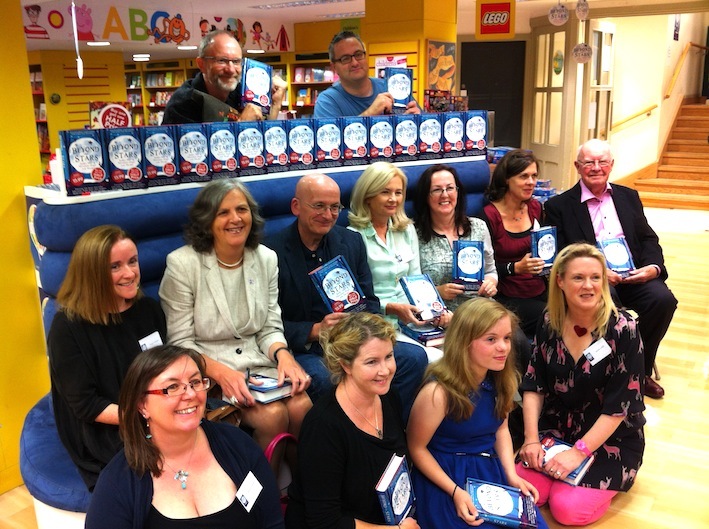 Emma Brade, above front row, blue dress, found herself signing books too – she won the writing competition run for 8-16 year olds. The prize? Publication! Beyond the Stars is a collection of short stories compiled by Sarah (the brave) Webb. Sarah and the folk at Harper Collins UK put twelve authors together with eleven illustrators (Oisin McGann illustrated his own story) and this book is the result. The stories are all set in winter and excellent for dark days under the duvet with a mug of hot cocoa. Best of all the proceeds go to Fighting Words, the creative writing centre here in Dublin. It is aimed at children and young adults and was set up by Roddy Doyle and Sean Love. The launch featured a question and answer session introduced by Dave O’Callaghan and chaired by Elaina O’ Neill from CBI. Sarah was joined by Niamh Sharkey and Roddy Doyle, and they chatted about the stories, how it all came together (the term ‘herding cats’ was mentioned more than once), and the work done with children and teenagers at the Fighting Words centre. Elaina chats with the panel. Whatever Dave and Aoife are talking about it’s like, ya know, intense? Like all the other contributors I was anxious to get everyone’s signature on my copy of the book. As we all know each other well you’d think it wouldn’t be a big deal but we were all like, well, kids about it! I was rather star-struck getting Roddy Doyle’s sig, and then, guess what? He asked me (and everyone else) to sign his. Cool or what? Here we are signing stacks of stock at Eason’s O’ Connell Street. Gordon Snell and Marita Conlon McKenna bagged the table. Beth tried to keep us organised and prevent us from double-signing a stack…. On Friday, a sneak peek at our contributions to the book. This entry was posted in Marie-Louise Fitzpatrick, Michael Emberley and tagged Beyond the Stars, Fighting Words, Harper Collins, Sarah Webb by The Belugas are Watching. Bookmark the permalink.